RETHINKING THE STATUS QUO. Companies drawing oil and gas from under the world’s oceans have long practiced the same mantra as campers: leave it as you found it. Once they’ve extracted their fossil fuels, they remove their rigs and are on their merry way. But now, a group of 28 researchers is challenging this standard practice of removing offshore installations once they’re no longer in use. They laid out their argument in an article published last week in Frontiers in Ecology and the Environment. DECADES OF REMOVALS. The practice of removing all offshore equipment after use dates back to the 1958 Geneva Convention on the Continental Shelf, which stated: “Any installations which are abandoned or disused must be entirely removed.” The idea was that this would prevent oil and gas companies from simply littering the world’s waterways with unused equipment. In the decades afterward, some nations agreed to make exceptions to that rule, but a 1995 controversy over the removal of one installation in particular led to a ban on leaving equipment in the North-East Atlantic region for any reason other than a technical one (for example, steel installations above a certain weight are OK to leave behind). BETTER FOR EVERYONE. Since then, complete removal has been the standard practice across the world, but according to the researchers, that shouldn’t necessarily be the case. They assert that some of the 7,500 oil and gas platforms set for removal in the next several decades are extremely important to their local environments. Removing them could actually be harmful. “We have observed a significantly increased biodiversity around the old facilities and encourage the authorities to consider, in each individual case, whether an exemption from the demand for removal can be granted,” Jonas Teilmann, one of the study authors, said in a news release. 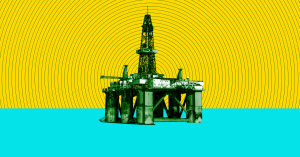 “By leaving the rig in place, we may ensure greater biodiversity in the sea. The physical structures also ensure that the areas will not be trawled [fishing by dragging a net across the sea floor]. The heavy trawls turn the seabed into a uniform desert with poor biodiversity,” he added. Removing these thousands of installations will likely cost about $210 billion, according to the researchers. By rethinking how we decommission offshore installations, we could help save marine life, and save ourselves a ton of money, too.